The V-mod Express Kit is an authentic cartridge battery set from Vapmod includes everything from the original set but without the XTank Cartridge for those of you that already have your own. 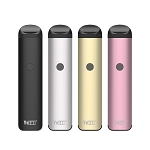 It sports a high grade lithium-ion battery with 900mAh capacity that instantly sets it apart from the rest of the other premium options on the market. With a capacity that big you can expect for to keep you pumping out fresh clouds for days at a time. 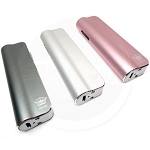 The V-mod has a universal 510 thread connection that sits inside the mods body for protection and ultimate discretion. Just attach the included adapter to your oil attachment and drop it into the V-mod's port for an instant connection. It is designed to support cartridges as large as 11.5mm in diameter so compatibility will rarely ever be an issue. After you have a cartridge connected and ready to go, you do the rest using the single oversized control key. This one button allows you to operate and use the entire device with just one hand for the stealthiest sessions on the go. Rapidly click that button five times to power it on or to lock it for safe travels. While it is on you can click it three times to adjust your voltage output setting. You have three preset options that will cover your needs for the widest range of concentrated oils. Each time you change the voltage setting watch the LED power indicator surrounding the button to see what level you are selecting at a glance (2.6V Green, Yellow 3.3V, Red 4.1V). After you've found your ideal setting the V-mod will automatically adjust to that level each time it is powered on until you manually change it. 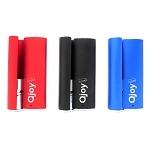 Every V-mod Cartridge Battery also features a cutting-edge preheat mode that uses a low output to warm your cartridge and clear any potential clogs inside. Just press the power button 2 times and the LED will begin flashing red for up to 15 seconds at a time, cancel at any point by pressing the button one more time. 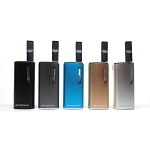 Pick up your authentic Vapmod V-mod Express Kit today in your choice of color. If you need to also purchase a cartridge upgrade to the Includes Cartridge option above and receive the authentic XTank 1.2mL ceramic core cartridge from the same brand.